The Vic Firth 7A wood tip drum stick has a tear drop tip, and is perfect for light jazz and combo playing. The Vic Firth American Classic drum sticks are turned from select hickory – a dense wood with little flex for a more pronounced sound. 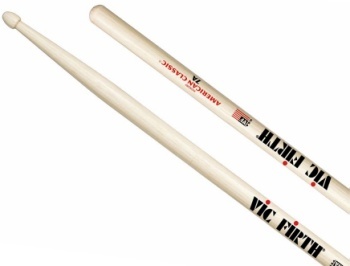 These stick combine tradition with Vic Firth style and bold designs for a fuller sound. Hickory is also capable of withstanding a great deal of shock, making it durable and desirable for drumsticks.